A few times a month come fuel up time I‘m faced, like all so many of us, with the choice of reaching for the premium high octane ‘feel good’ gasoline, or instead for that regular sludge so many of us automotive sadists force in to our unappreciative automobiles. The process usually involves clenching my toes, grabbing regular 87 octane and just sticking ‘er in. I then frequently spend the next ten minutes apologizing to my car, explaining the realities of life and money management, and generally praying for forgiveness to the automotive overlords. But this complex set of hydrocarbons that we call fuel is a complicated mother. This means that the average consumer, including myself, is not always sure what fuel to go for. Sure we know which it says our car needs right there on the gas flap, but there are so many lingering questions. Does anyone know if these 'active added additives' we hear about on TV are actual key ingredients in prolonging your powertrain’s lifespan? Has anyone ever wondered if these ‘detergents’ were engineered in the marketing department? And has anyone figured out which oil company sells the best fuel and which we should avoid? What about fueling up your Volkswagen Golf with premium fuel on payday? Does that provide any tangible benefit in performance or economy? In the name of science I travelled to Texas, where the world's largest company makes something some of you may have heard of - beautiful, wonderful, victorious (and previously blue in colour) V-Power. Were my questions a bit brash and uneducated? Absolutely. Were they relevant? You bet. Here’s what I found out. For starters, Shell's Technology Centre in Houston is immense. It stands as one of the largest industrial centres in the world. Wing after wing of labs and cubicles, over 1 million square feet actually, all neatly filled with over 2,000 engineers and scientists, and each with an impressive array of pens tucked inside their shirt pocket. They spoke with great passion and continually referred to the sacred art of wine making when describing the intricacies of manipulating complex hydrocarbons and the 300 different components inside V-Power. But it wasn't until they showed us a piece of equipment so advanced that it could detect a cup of sugar in Lake Ontario, a body of water the size of Belgium, that I suddenly became very convinced that Shell is on top of the game. But enough of that. Here are the standout pieces of knowledge I consumed about the characteristics of fuel. First up, the burning valve demonstration by Dr. Jim Macias and John Mengwasser. We were shown two valves. Each had driven 5,000 kilometres and each was identical to the other. They both received the same grade of fuel (premium), but one had the lowest required additives (essentially what you'd get at a no-name station) and the other had V-Power. The end result was shocking to say the least. The valve that received the fuel with less additives was corroded and irregular, which resulted in a prolonged combustion when torched - as shown above and below. The V-Power valve was, as nearest makes no difference, factory fresh. Witchcraft. This is made possible by the additives in V-Power that keeps inlet systems clean and keeps emissions down. Different components under hot temperatures polimerize and build up deposits. These detergents are needed to act on these specific components to 1) Keep clean and 2) Clean up grit from the surface. In contrast, the lower quality fuel only had the minimum (specified by regulation) of cleaning agents, which cannot properly clean your engine, especially forced induction power plants. In the process they also manage to exceed the latest EPA tier 3 standards resulting in even lower Co2 emissions. Keeping engines factory fresh throughout their lives is exactly what motivates the staff at Shell. As an enthusiast, I commend their noble mission. Then we were shown a beige SUV. A car that was bought second hand, and subsequently treated to the Laurent Perrier Grand Cru of fuels - Shell V-Power. The engine and valve covers were taken off, an injector was removed, and a handheld boroscope camera that wouldn’t look out of place on a surgeon’s table was shoved in to an injector. What we got to witness was remarkable. No buildup of any kind. No usual clogged injector channels. No fuel drizzle as opposed to a crisp spray. No unburnt fuel left in the exhaust. No erosion anywhere. The only way to describe it is as if the Lexus went Benjamin Button and reversed the space time continuum to return back to it’s infant years as a factory fresh luxury SUV. Remarkable. The engineers then dropped the following impressive bit of research evidence on me. Are you ready to be persuaded to buy premium fuel regardless of what's suggested? If you’re not, stop reading now. If you are, well, here goes. We’re talking improved performance and responsiveness, improved thermal stability under extremely hot temperatures, improved longevity, improved fuel economy, a smoother engine that is restored to original condition, and much, much happier fuel injectors all because of V-Power's superior detergents - dubbed 'Shell's Nitrogen Enriched Cleaning System.' And that’s where the light went on in my head. I realized that you can’t afford to simply ignore high octane V-Power if your owner’s manual doesn’t specify it. But before I would tell myself that the next tank of fuel that went in to my trusty DD was a tank of premium, I had a few more things to sort out. I learned that the active added additives are indeed key ingredients in prolonging your powertrain's lifespan. In fact, they are the only difference between V-Power fuel and a similar octane fuel from a competing brand. As the engineers told us in quite dramatic fashion, "gas is gas, and it's what gets added to the fuel before making it to the pump that makes the key difference." So there you have it, all fuel is the same when bought from the refinery as it's a heavily regulated commodity. Brands differ in quality only based on the additives and detergents carefully thrown in to the mix. And when it comes to providing the greatest benefit to the driver and car, there's no substitute for V-Power. To further drive my point home, Alonso took a lap of Fiorano in his F1 car on consumer spec V-Power and he was only a second off the F1 engineered V-Power's pace. Again, remarkable. Older cars will equally benefit from high octane, zero ethanol, unleaded V-Power. Although with high performance classics, it is always smart to install stainless steel intake valves, use lead and octane boosters where needed, and generally never letting it sit for long periods of time. Fuels with ethanol in them will also eat the rubber diaphragm in older car's mechanical pumps which cause fuel starvation issues that effect the mixture, resulting in back fire and dramatic fireworks from the carburettors. Therefore, even for classic cars, V-Power is key. At the end of the day, all I can say is that I'm convinced. I now no longer classify V-Power as a fuel only specced to high performance sport and super cars, with little to no use or benefit to my modest daily driver. 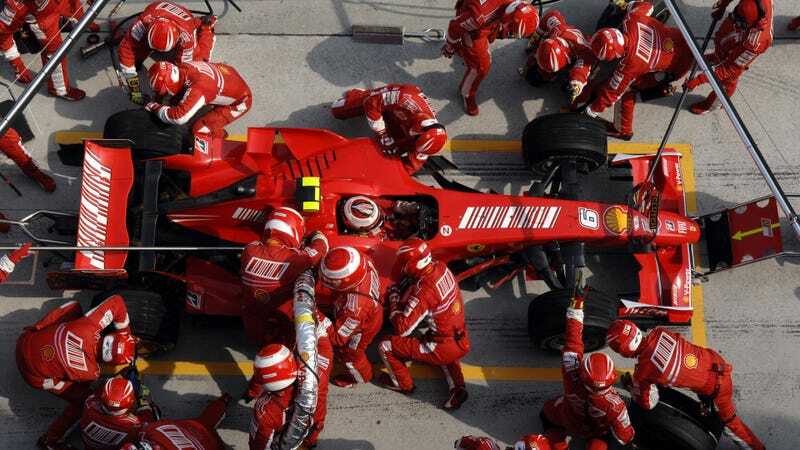 I have witnessed first hand Shell's commitment to research and development through their sustained high investment, $1.3 billion in 2012, in tech and the successful and historic Scuderia Ferrari partnerships. I have seen the light, and for the sake of your chariot's internals, I hope you have to. Full disclosure: The friendly folks at Shell wanted me to learn about V-Power so badly, they flew me out to Houston, Texas, put me up in one of the city's best hotels, took me around what was basically a play date inside their Technology Centre, and generally took exceptional care of me. For that, thank you Shell.